In the original UK Version, opening credits appear against documentary-style establishing shots of the pithead and the men emerging from underground and walking down towards the pit owner to begin their strike. It is released with an "...unfortunate moralising commentary spoken by Lionel Barrymore - still persisting in current prints." However the nature of the changes to this film are much worse than this. The US version used a plain background for the main title and hectoring hyperbole voiceover that demeans the miners families as "little people" and drastic scene cuts lessen the graphic impact of the original. The US cut version ends with the rising camera above the pit as the Lord's prayer is spoken after the disaster with dubbed verses of the Lord's prayer heard and a final stock shot of heavenly clouds added with a longer voiceover. If you have not seen this ending, then you have not seen the film. 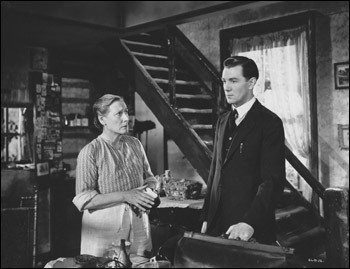 The American version added an opening and closing voice-over narration by Lionel Barrymore and changed the main and end titles, while the departing scenes and dialogue at end between Davey and his mother were cut completely. The original UK release has the first line of the Lord's prayer heard only as the camera rises to the pitch black sky above the pit. The prayers become a muffled dirge. It then fades in to the final scenes as Davey's mother is downstairs preparing her son's packed sandwiches for his return to work at the pit. Davey emerges down the stairs dressed not in work clothes, but a suit. He tells his mother he is going to work for the union. "You are all I have left now..." says his mother who takes an apple and gives it to Davey for the train journey. He goes to the front door and turns back to his mother who stands impassively at the hearth. The final shot is an exterior of the cottage with Davey leaving while his mother is watching framed closely in the window. Her shoulders droop in a sigh of resignation and it dissolves quickly to the end credits. "...has been charged with four counts of gross negligence manslaughter and colliery owner.............. has also been summonsed to answer four counts of corporate manslaughter. Crown Prosecution Service deputy head of special crime ..............said Mr Breslin, Mr Hill, Mr Jenkins and Mr Powell lost their lives when the mine was engulfed by an "enormous inrush" of water. He added: "It is estimated that, in around three minutes, more than half a million gallons of water entered the section of the mine in which the men were working. "........... was employed as mine manager ................ and it is alleged he caused the deaths of four miners by mining into old, flooded mine workings in breach of health and safety regulations. "The CPS has now carefully considered all the available evidence in this case, including detailed expert evidence. "We have concluded it is in the public interest to charge the mine manager...."
Re: 'The Stars Look Down': is there a complete UK print of this? You managed to get the missing sections from somewhere. English films have been ignored too much. Yes, I have the complete 'Stars Look Down' on 16mm an original print date coded 1939. I had no idea that the begining and ending was lost until I watched it and realised that this contemporary print was drastically different to the version I was familiar with from regional film theatre and TV showings over the years. I never liked the ending where the mining community drop to their knees and pious hymn singing, heavenly choir, hyperbole voice-over, and clouds. the reviewer writing his story synopsis for the British Film Institute catalogue is describing the cut version and believes the added voice-over to be the only alteration. Hopefully the National Film Archive holds the original version but unless someone knows the differences then any film can become 'lost' in this way. www.Ian-Partridge.Com ~ Web page content photography and design ~ Copyright ©2012 2018 Ian Partridge.